What’s A Shoulder Angel ? A shoulder angel is another example of how angel belief has crept into all areas of life. The term is used to describe a plot device used for either dramatic or humourous effect in animation and comic strips (and occasionally in live-action television). The angel represents conscience and is often accompanied by a shoulder devil representing temptation. They are useful for easily showing the inner conflict of a character. Usually, the angel is depicted on (or hovering near) the right shoulder and the devil or demon on the left, as the left side traditionally represents dishonesty or impurity. 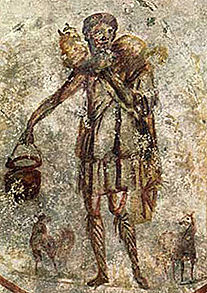 The shoulder angel often uses the image of a traditional angel, with wings, a robe, a halo, and sometimes a harp. The shoulder devil likewise usually looks like a traditional devil with reddish skin, horns, barbed tail, a pitchfork and (sometimes) cloven hooves. Often, both resemble the character who is in conflict, though sometimes they will resemble other characters in the story who are responsible or mischievous. The idea may have originated from the Christian concept of a personal guardian angel, who was often considered to be matched by a personal devil who countered the angel's efforts ( Especially in popular medieval dramas, like the 15th century The Castle of Perseverance. In both this and Christopher Marlowe's play The Tragical History of Doctor Faustus, of about 1592, the "Good Angel" and "Bad Angel" offer competing advice to the hero. There is a similar Islamic belief of Kiraman Katibin, two angels living on either shoulder of humans which record their good and bad deeds. However, these angels do not have influence over the choices one makes, and only record one's deeds. They are also called Qareen. It's also possible to view this image in Freudian terms, with the Angel representing the super-ego (the source of self-censorship), counterbalanced by the Devil representing the id (the primal, instinctive desires of the individual).